Florida’s tropical climate is the perfect environment for introduced exotic organisms from around the world to thrive. The term exotic means native to somewhere else. Exotic reptiles such as the giant alligator swallowing pythons tend to get more press than some of the lesser recognized exotic plants and insects. Some of the most destructive pests in Florida came here from somewhere else. While most exotic plants were brought here intentionally, most exotic insect pests were accidentally introduced to the state. Because insects are small they can easily miss detection and can travel with live plants, plant parts, such as fruit, or in harvested plant products, such as wood. Just a few recent examples of introduce insect pests include Asian citrus psyllid (ACP), Formosan subterranean termite, pink hibiscus mealybug, and Asian cycad scale. The Florida Department of Agriculture and Consumer Services currently detects an average of 2.5 new exotic pest introductions to Florida per month. Introduced pests can feed on crops and spread pathogens that make growing food and ornamental plants more difficult and costly. Consumers are affected by higher prices for fruits and vegetables that need to be shipped from distant locations. Avid gardeners may realize that plants that used to be carefree now may be difficult to impossible to grow due to exotic pests and the diseases they can transmit. The vast majority of exotic introduced plants cause little harm to the environment. In fact, many of Florida’s food crops and ornamental plants are exotic, but do not have the capacity to multiply and spread into natural areas, so they are not considered a threat. Some introduced plants are able to escape cultivation and thrive in natural areas, displacing native plants and the species that rely on them, these plants are considered invasive. Examples of invasive plants include air potato, Brazilian peppertree, cogongrass, water hyacinth, and Australian pines, just to name a few. There is a good reason these invaders are able to multiply quickly. When exotic pests and weeds arrive here they often lack the normal natural enemies of their native home. Insects and plants in their native range have pathogens and insects that help keep population levels in check. Most exotic pests in Florida are not a significant problem in their native home range due to suppression of the population by natural enemies. What can be done to reduce the environmental and economic harm of introduced pests? Classical biological control is a technique to reduce invasive insect and plant populations that is utilized by the Florida Department of Agriculture and Consumer Services and the United States Department of Agriculture. With classical biological control natural enemies are imported from the native range of the pest and released in small numbers in an attempt to establish a permanent population. First the exotic pest must be accurately identified to determine where it naturally occurs. Next, scientists go to the pest’s home range and look for organisms that attack it there. Natural enemies with that show promise are brought back to containment facilities in Florida where they are extensively studied. If the scientists and regulatory agencies agree that the organism will not cause environmental or economic harm, it is released. The population is then monitored to see if the organism has been able to establish a self-sustaining population. 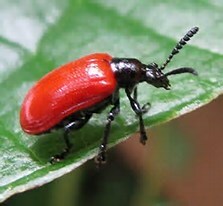 The State of Florida is currently rearing two insects for release that are available to homeowners upon request, air potato beetle also known by the scientific name Liliocerus cheni and a tiny wasp who’s young feed on immature Asian citrus psyllids (ACP) known only by the scientific name, Tamarixia radiata. The air potato beetle was brought from Nepal and China to help combat invasive air potato vines that can form dense canopies which shade out and compete with native plants altering native ecosystems. The oblong, pea sized, red and black beetle and its shiny slug like larvae feed exclusively on air potato. It is hoped that over time the defoliation will help to reduce the vigor of the vines and reduce areas that are choked with aerial vines. Air Potato Beetle order forms are available at the UF/IFAS Flagler County Extension office located at 150 Sawgrass Rd. Bunnell, FL 32110. Since being introduced to Florida ACP has helped spread the deadly bacterial disease citrus greening to many of the citrus trees planted in the state. The insect acquires the pathogen through feeding, and then transmits it to healthy trees. Adult psyllids are mottled brown, about the about the size of a grain of rice, and can fly over a mile in search of food and mates. The Asian citrus psyllid wasp, Tamarixia radiata lays an egg under ACP juvenile nymphs where it hatches and begins to feed on the host insect, eventually killing it. The immature wasp develops inside the young host psyllid’s body from which it emerges as a fully formed adult. Tamarixia radiata can be ordered from the Florida Department of Agriculture and Consumer Services website at bit.ly/tamarixia . Florida residents can help combat the spread of destructive Asian citrus psyllids and air potato vine by applying to receive free beneficial insects for release on their properties. Collaborative efforts between the United States Department of Agriculture, the Florida Department of Agriculture and Consumer Services, and the University of Florida help to provide these insects throughout the state to areas most in need due to high levels of infestation. The goal is establishment of the insects for long term control with minimal future required releases. Sol Looker is the Residential Horticulture Extension Agent and Master Gardener Coordinator at the Flagler County Extension Service, University of Florida. For more information contact the office, (386) 437-7464. The Extension Service is located at 150 Sawgrass Road Bunnell, Florida 32110.